The biomedical world relies heavily on the definition of pharmaceutical targets as anessential step in the drug design process. It is therefore tempting to apply thismodel to genetic diseases as well. However, whereas the model applies well togain-of-function genetic diseases, it is less suited to most loss-of-function geneticdiseases. Most common diseases, as well as gain-of-function genetic diseases, arecharacterized by the activation of specific pathways or the ectopic activity ofproteins, which make well identified targets. By contrast, loss-of-function geneticdiseases are caused by the impairment of one protein, with potentially distributedconsequences. For such diseases, the definition of a pharmaceutical target is lessprecise, and the identification of pharmaceutically-relevant targets may bedifficult. This critical but largely ignored aspect of loss-of-function geneticdiseases should be taken into consideration to avoid the commitment of resources toinappropriate strategies in the search for treatments. Target identification is an essential first step in today's drug discovery process. Thisprinciple is built on the premises that, to be efficient, drug development must bedirected against identified biological mechanisms at molecular level (pharmaceuticaltargets). This concept is the core of modern drug discovery and is the primarydifference between modern and former drug discovery, when drugs were discovered moreempirically than rationally, and were put on the market without much knowledge of theirtargets. Today's drug discovery has, by contrast, become largely target-dependent. 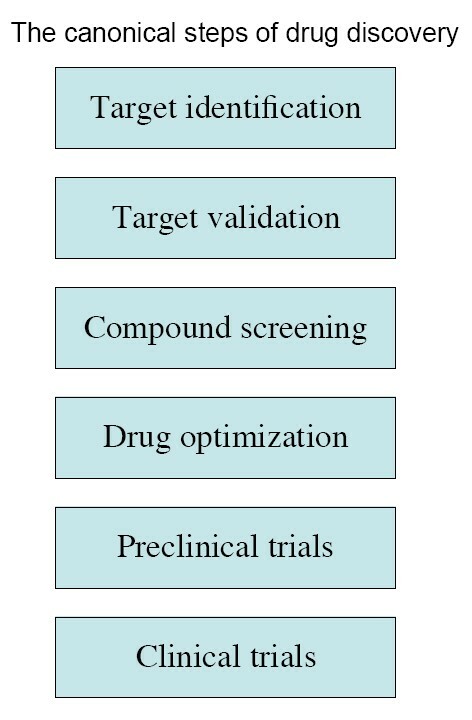 The industry standard for drugdiscovery is defined by an almost invariant frame consisting of sequential steps: targetidentification, target validation, compound screening/design, compound optimization,preclinical (animal) trials, and clinical trials (Figure 1)[2, 3]. The canonical steps of modern drug discovery. Target identification is thefirst and obligatory step in the canonical paradigm of drug discovery. This conception of the drug discovery process is commonly accepted beyond the industrialworld and is deeply rooted into the biomedical field, including academia. The sequencingof large genomes is often justified as a way to enlarge the repertoire of targets. The sequencing of the human genome,for instance, was sold as such to the decision-makers. The pharmaceutical industry'sappetite for targets is filled by academic laboratories and by spin-off companiesspecialized in the commercial identification of targets. Although the pharmaceuticalindustry has experienced a decline in bringing new drugs to the market in recent years,the target-based approach remains by far the dominating drug discovery paradigm[3, 4]. Since rare diseases were neglected for decades by both policy-makers and industry, drugdiscovery for rare diseases has a relatively short history, and remains a dwarf in termsof expenditure when compared to drug discovery for common diseases (cardiovasculardiseases, cancer, diabetes, Alzheimer's disease, etc.). It may, therefore,sound like a reasonable endeavor to apply to an emerging field a strategy that is thestandard in another not-so-distant field. For this reason, when it comes to geneticdiseases, a shared view exists within the scientific community that the target-baseddrug development concept should apply to genetic diseases as it does to non-heritablediseases. This one-size-fits-all strategy is conservative but, as we will see, may notbe the optimal strategy, since some genetic diseases are only poorly adapted to it. Gain-of-function (gof) genetic diseases, as the term indicates, are caused by theectopic or increased activity of the mutated gene product. Proteins mutated in gofdiseases may or may not carry a dominant-negative effect. Ectopic or increasedprotein activity most often turns on cellular processes that normally do not occur ina healthy cell, thereby triggering a pathology. In this respect, gain-of-functiongenetic diseases are comparable to the common diseases that are in the focus of thepharmaceutical industry (cancer, stroke, infectious diseases, Alzheimer's disease)and that may also be defined, in first approximation, as an activation ofpathological cellular processes that do not occur in a healthy cell. Therefore, it isof no surprise that the concept of the target-based drug design applies well to thisclass of diseases. Who could claim to have a better approach against polyglutamineexpansion diseases, for instance, than neutralizing the faulty protein and blockingthe downstream chain of deleterious events? A small proportion of loss-of-function (lof) genetic diseases are also well-suited tothe concept of target-based drug design. These are mostly diseases with a simple andwell-understood physiopathology, like channelopathies and some metabolic diseases. Insuch diseases, the reduction of a cellular function resulting from the mutation maybe pharmacologically corrected by either stimulating this function or inhibiting anopposite function (Figure 2). For instance, in Myotoniacongenita (a recessive disease caused by mutations in the chloride channel geneCLCN1), malfunction of the chloride channel impairs the skeletal musclerepolarization, the voltage-dependent sodium channels are improperly opened, and asubsequent myotonia ensues. Myotonia symptoms can be effectively reduced by a sodiumchannel antagonist, mexiletine, which decreases the muscle excitability, and therebyre-establishes the balance between excitation and relaxation  (Figure 2A). The concept ofpharmaceutical targets (chloride channel and sodium channel in this case) makesperfect sense here because i) the physiology of muscle excitation is well-known andii) channels are highly amenable to modulation by drugs. Another example is provided by metabolic diseases. Metabolic diseases are aphysiologically-damaging alteration in the amount of a key cellular metabolite, andare often caused by loss-of-function mutations in enzyme-encoding genes. Whensupplementation treatments are not possible, metabolic diseases may be treated bypharmacological strategies aimed at restoring an appropriate level of the keymetabolite by playing with adjacent metabolic pathways (Figure 2B). Here again, the relatively simple physiopathology allows for an easyidentification of therapeutic targets. Unfortunately, the concept of a pharmaceutical target fits poorly with the majority ofloss-of-function genetic diseases. This is due to the specific position thatloss-of-function genetic diseases occupy in the spectrum of disorders: it isconceptually difficult to correct the absence of a protein by pharmacological means(Figure 3). This simple but largely overlooked fact has broadimplications for drug discovery. Schematic view of the physiological consequences and possible countermeasuresagainst gain-of-function and loss-of-function mutations. In this example,the protein of interest (pink octogon) normally supports the assembly of a proteincomplex. (LEFT) In the wild-type situation, a complex is formed with other proteinpartners (blue polygons). (MIDDLE) A gain-of-function mutation results in theabnormal formation of protein polymers and protein aggregates, which may haveconstitutive activity or be toxic to the cell. Therapeutic options will consist inneutralizing the mutated protein and blocking the formation of aggregates withother proteins; pharmaceutical targets are already identified or may be identifiedreadily in downstream pathways. (RIGHT) A loss-of-function mutation will result inthe absence of the complex. The biological processes depending on the complex willbe perturbed. Pharmaceutical targets are more evasive in the loss-of-functionsituation. Duchenne muscular dystrophy (DMD), one of the most studied genetic diseases, is due tothe impairment of dystrophin, a structural protein underlying the muscle membrane. After20 years of research on dystrophin, neither the role of dystrophin in a healthy musclenor the physiopathology of the disease are fully understood yet [6, 7]. It is established that the absence ofa functional dystrophin results in muscle fibre calcium overload, mislocalization ofsignaling proteins, and membrane fragility. Calcium overload may in turn translate intodozens of secondary effects, ranging from increased muscle excitability to impropercaspase activation. Mislocalization of signaling proteins and membrane fragility, thetwo other main traits of DMD, may also be subdivided into numerous items, some of thembeing deleterious and others not. What, then, causes the end-point phenotype ofprogressive muscle necrosis? Is it just one of the many secondary effectors or, morelikely, a combination of several of them? 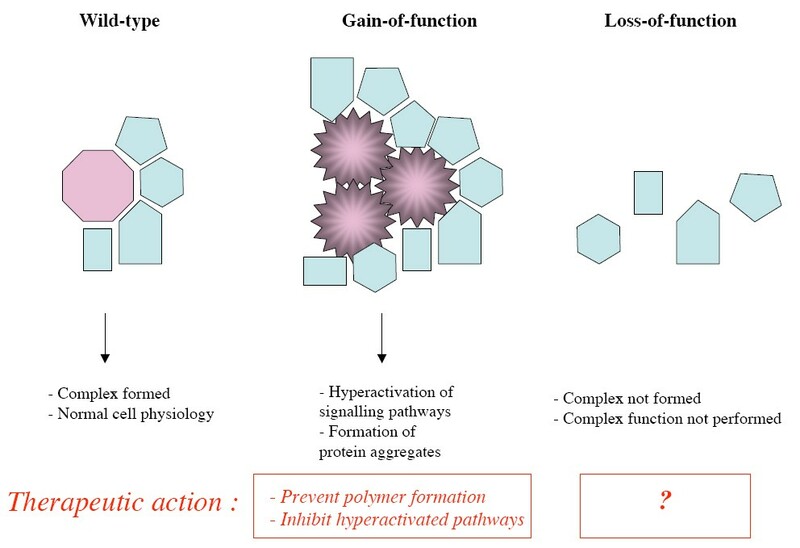 As in many other diseases affecting structuralproteins, the loss-of-function mutation has a pleiotropic effect, distributed amongstvarious cellular functions, pathways and compartments. Pleiotropy is also a hallmark of diseases affecting genes involved in central cellularprocesses: DNA replication and maintenance, transcription and RNA processing, proteinmaturation, trafficking, etc. Spinal muscular atrophy type I (SMA 1), one ofthe most frequent genetic diseases, is caused by mutations in the SMN gene.Although the genetics of the SMN locus is complex, it can be considered as alof disease, since it results in a reduction of functional SMN protein. The SMN proteinplays a role in spliceosomal snRNP biogenesis, and SMN mutations seem to resultin a shortage of functional spliceosomes [8, 9], thereby globally perturbing mRNA processing. The number ofmisprocessed mRNA species is not yet fully established, but is probably very large. Howmany of them contribute to the progressive death of motorneurons? Probably more thanjust a few. As with the mRNA processing genes, so too with the transcription factor genes. How manymisregulated genes are responsible for the numerous symptoms observed in Cleidocranialdysplasia (CCD) and Waardenburg syndrome, to mention only these two diseases among themany affecting transcription factors? What are the pharmaceutical targets for Emery-Dreifuss dystrophy (mutation in a nuclearenvelope protein), for Schwartz-Jampel disease (mutation in the basement membraneprotein perlecan), for Centronuclear congenital myopathy (mutation in dynamin, atransport vesicle protein)? These few examples demonstrate that the concept of a pharmaceutical target – abiochemical entity which can be levered by a drug – is unsuitable to manyloss-of-function genetic diseases. Twenty years ago, in the early days of human molecular genetics, the scientificcommunity propagated the erroneous idea that, once a disease gene was identified, thetreatment would be around the corner. The following years have been sobering anddisillusioning. We should be careful not to repeat that mistake by spreading anotheridea, which might be as over-optimistic as the previous one: that genetic diseases willbe modeled around «targets», and that targets will be the key to treatments.In this view, targets identified by biologists will be passed on to medicinal chemistswho will design target-based treatments. This scheme is in line with the contemporaryapproach of drug discovery. Unfortunately, when it comes to genetic diseases, twofactors greatly reduce the feasibility of this strategy: i) the definition ofpharmaceutical targets is, at best, vague, for the majority of lof genetic diseases; ii)to have some chance of success, a target-designed treatment against the above-mentioneddiseases should be directed against not one but several targets simultaneously –an almost impossible challenge. There is another contextual element which is rarely mentionned, but which should also belooked at with open eyes. The contemporary drug discovery strategy has scored somespectacular successes on certain fronts. However, other less successful stories remindus that it is by no means a trivial matter to battle diseases, even when the targets areclearly identified and the picture looks simple. In the fight against infectiousdiseases, for instance, in which the pathological process starts by a sequential andalmost linear chain of well-characterized events, we are still a long way from totalvictory. The same is true for cancer. Some forms of cancer are far from contained,despite well-known targets and big spending. What then, are the chances of findingtreatments against genetic diseases on a large scale, by applying the same and, in thiscase, a less appropriate strategy with much less money? This dark picture does not mean that money invested in trying to dissect out themechanisms underlying physiologically complex lof genetic diseases is useless. It isimportant to carry on investing in the understanding of the physiopathology of thesediseases, but the main reason to do it might not be the one usually put forward(finding targets that pharmacologists and chemists will turn into treatments).Otherwise, the scientific community may once again promise more that it candeliver. The first reason for investing in the understanding of genetic diseasephysiopathology is that even though the efficiency of the «target first»strategy as a global approach has been overestimated, its fallout on specificdiseases must not be neglected. There will be instances when findings involving thephysiopathology will shed light on mechanisms rapidly amenable to drug therapies,such as idebenone against Friedreich ataxia . However, such situations are rare and there is no reason tothink that their proportion will increase. The main drive to invest in the understanding and the fine characterization ofgenetic disease physiopathology is that it creates a knowledge environment. Thisknowledge environment has at least two benefits: Firstly, it will be an essentialtool to evaluate the efficiency and the mode of action of future treatments, whichmay or may not (see below) originate from a target-based approach. Increasing thenumber of available parameters and endpoints allows for a better appraisal oftreatment efficiency. Secondly, with 5,000 or more genetic diseases around, onehas to think global. The knowledge environment developed oneach disease (or group of diseases) can be used to chain diseases togetherin anetwork of information. Genetic diseases, even those for which little is known, canbe placed on interactome-like virtual maps (Figure 4) based onall sorts of information, ranging from literature keywords to transcriptome geneclustering and bioprofiling of body fluids. 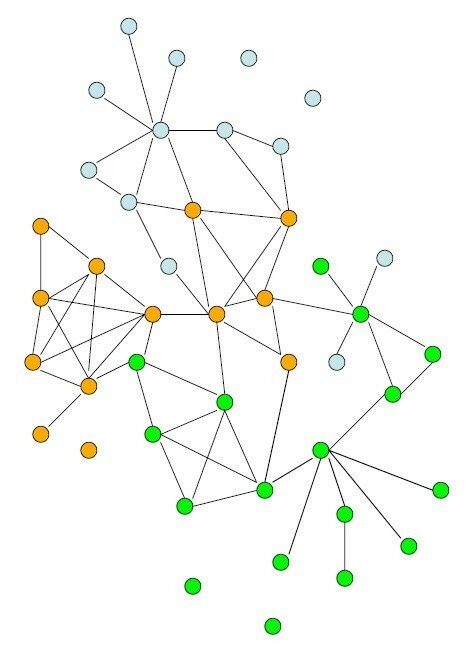 As treatments appear for some diseases,taking advantage of the network connections will rapidly provide therapeutic hintsfor other still-orphan diseases, and may constitute the largest payoff of theinvestment made on trying to dissect the physiopathology. Thinking global in the fight against genetic diseases. Genetic diseases(circles) can be put on virtual maps based on multiple levels of biologicalinformation. Once treatments are available for a few diseases, taking advantageof the connections will facilitate the identification of treatments for otherdiseases. It is probably time to reevaluate the choice of the «target first» strategyas the main option in the search of pharmaceutical treatments against physiologicallycomplex lof genetic diseases. For these diseases, success may well come from a lessambitious but more pragmatic strategy: the «screen first, understand later»strategy. This alternative strategy, also referred to as physiology-based, is ofinterest in all indications where no obvious target is available . In the search for treatments against rarediseases, the bonanza of existing drugs has been surprisingly underexploited up tonow. Yet, anecdotal evidence demonstrates that old drugs can have an unpredictedbeneficial effect on some genetic diseases: colchicine was serendipitously found tocure Familial mediterranean fever (FMF), and acetazolamide is active against Episodicataxia despite any rationale underlyings. Since these discoveries are the result ofsheer luck (co-occurrence of diseases in one case and diagnostic error in the other),one can extrapolate that the pharmacopea contains many more unraveled gems.Furthermore, beyond approved drugs, chemical libraries constitute another vastreservoir of potentially useful molecules against genetic diseases. These chemicalresources should be taken advantage of more thoroughly. Currently, the limitingfactor for molecule identification is the shortage of high-throughput screening (HTS)systems. For most genetic diseases, in vitro models either do not exist orare not suitable for HTS screening. This bottleneck is less a technological one thanthe result of insufficient development. Committing financial resources to overcomethis limitation and running high-throughput molecule screens might at the end of theday be one of the most cost-efficient investments in rare disease research. After being ignored by governments for decades, rare diseases are now a biomedicalresearch priority in most developed countries. However, the fundamental difference thatexists between loss-of-function genetic diseases (the most numerous ones) and most otherhuman disorders has been largely overlooked. As a consequence, confusion exists in thedefinition of what the optimal drug-discovery strategy against the majority ofloss-of-function diseases is. In-depth reflection is necessary to resolve this issue andto avoid the commitment of energy and money to inappropriate research strategies.